The last time we tried these, sometime back in November, I completed the first two and stopped about 10 minutes into the third as my power was around 310. Today the power averages were 320, 321 and 321 for each of the 20 minute efforts. My biggest concern doing these inside was just staying focused for that amount of time. On the first effort I had two songs lined up that were each 10 minutes. On the second effort I had three 7 minute songs and on the last I just watched Pawn Stars and read a magazine. Average power for the entire 90 minutes was 259 and normalized was 291. Cadence was from 86-89. I have another day with these this week and two next week. Ideally I get the next effort this week done in Tennessee on Thursday or Friday. 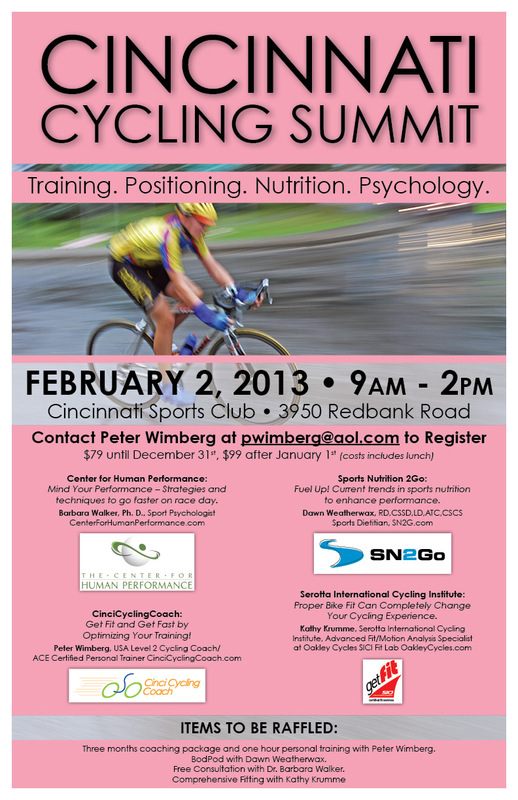 If you contact me at pwimberg@aol.com and mention that you saw the flyer for the 2013 Cincinnati Cycling Summit here on my blog I will give you another $10 off the early registration price of $79. For just $69 you'll be able to hear four great presentations and be eligible for some great prizes. The green line is cadence and was pretty consistent between 95 and 100. HR was above 170 by the end of 1.5 miles, hit 176 at about 3.6 miles and then peaked at 179 over the last mile. This would have my HR hovering in the 96-98% of max most of the ride. The blue line for speed, if flipped over, would be a good representation of the course profile. Power is pretty obviously going down gradually. The downhill section as mentioned in an earlier post is tough on the power. This is something to work on for the two remaining rides this winter. I've been using the last of the long steady state efforts to try to hold my highest power of the 3 or 4 efforts just to get used to pushing a little harder when tired. Pretty much the same as the 4x12's with power at 323, 327 and 329. Looking at two more of these sets this week and then 3x20's next week. Your Brain on a Bike (Cool Gus Publishing 2012) by John Brent Pyre Without fail every Tuesday from May through September at the Cleves Time Trial Series as we’re sending off riders to battle the 10.25 mile course we hear any of the following: “This is the first time I’ve had this bike out all year” “I haven’t trained at all” “I’ve been feeling really slow lately” “I don’t know why I’m here. I’m not very good at this event” “Lets go. I wanna get this over with” What kind of performance can you expect with those comments? Not good and this book will reinforce the idea that training your mind is as critical as the time put into training your body. Ultimately we will achieve our best results when both being our mind and body are in optimal condition. I know that this ‘train your mind’ idea can seem a little out there. As we all know, cycling is really just about being strong on the bike and having the best strategy for the event. If this is what you think, then you probably don’t need to read this book because to train your mind you need to open it first. For those who are willing to do this by taking the simple steps needed to get our mind in the game I’d recommend taking the time to read these 130 or so pages. One very simple theme to the book is to stay positive and believe in your training, your skills, your equipment and your abilities. You do this by learning how to control your thoughts, being aware of all that is going on around you, being confident, taking care of your body, and being sure to have fun. Seems easy enough and it actually is if you decide to be aware and properly prepare. The author will allow you to follow a mythical rider as he encounters many of the same issue we encounter in our training and racing. I’ve read several other books and magazine articles on this topic. There is strong evidence that the top athletes aren’t necessarily any stronger. Rather, they have taught themselves to tap just a little bit deeper in that reserve that our mind has established to keep us from going over the edge with our performance. We’re all looking for added power and/or endurance on the bike. We can buy faster wheels, lighter frames, and power meters and then train like it’s our job. While this could yield great results why not spend a fraction of that and devote a little time to learning how to use your mind to improve your performance? This book provides a comprehensive guideline to a variety of strategies to be more successful on the bike. I've noticed during several of the indoor time trials how much power some riders will put out at the start of the race. I suspect that some have never trained with power so they don;t really know what 300, 400, 500, or 600 watts feels like. Maybe they've read what the pro's can hold or have talked with others in a group ride and heard what they can hold. I think one interesting number in the results is the peak power by each rider. My strategy is to find the wattage zone that I think I can hold (370-390) and keep my average in that zone. From the excitement of the race I may go above that at the start but I try to settle in in the first minute. I've been around riders who are holding close to 500 watts average for that first minute(s). I wonder how much that is taking away from their ability to hold a steady and realistic power over the 6.2 miles. Even spiking the power that much at the end would seem to say that the rider may have left too much on the course. I'm certainly not criticizing any of the riders as they have to do what they feel is best for them but it never hurts to examine ones strategy. Today was the second of this winters indoor time trials. Last month I rode a 15:04 for the 6.2 mile Morgul-Bismarck course on the Computrainer. My best is 14:35, ridden last February. Todays ride was 14:45 with an average cadence of 98, average HR of 173 (95% of max and 107% of LT), max HR at 180 (99% of max, 111% of LT). Average power on the Powertap was 358 (4.65 watts/kg) and on 372 (4.83 watts/kg) on the Computrainer. Out of the 10 times I've ridden this event this was my fourth fastest. Hands down, this is the toughest 15 minutes in my training. Its very difficult, and almost impossible, to get this effort solo inside or out. I've come pretty close on a 15 minute climb near our house in Tennessee and certainly during the Cleves time trial. Maybe its just being inside on this one that makes it seem so difficult. Its does help to have music and others riding at the same time. The latter may also be the reason that its possible to push a little harder. All I know is that when i finish this thee is that feeling of being about to pass out and I'll be pretty drained for the next day. All from one 15 minute ride. I'll discuss the results with Coach Julia. We have more of the steady states coming up. Might be worth pushing into the upper end of the zone on those. I'd like to PR on the indoor time trial on one of the two remaining. Ten seconds should be doable. Your Brain on a Bike, by John Brent Pye, is recently published book about how to be mentally prepared to achieve optimum performance. I'm about 2/3 of the way through the 130 plus pages. I'll eventually be writing a review for the QCW website that I'll post here. I worked with Dr.Barbara Walker from the Center for Human Performance and have read numerous books on this subject. If mental training isn't a part of your training you're missing out on using your physical training to its true potential. Ever started a ride thinking that you're not going to do well? Every shown up for an event/race not completely focused? Have you ever felt great in your training just to feel less than great at the event/race? Ever been around other riders who are complaining about the conditions of the event/race? All of these affect your performance. 5000 page views in the last year...who would have thought? This is the data from the last 12 minute effort. After last weeks two days of 4x12 steady states and some circuit and spin classes all clustered in three days I rode pretty easy over the weekend. Sunday was an off day with four more of the 12 minute efforts scheduled for Monday. The wattage held on the steady states yesterday was 322, 324, 325 and 329. Could have done another 12 minutes if needed. Today is just a one hour recovery ride with another set of the 4x12's scheduled later in the week. Yesterdays efforts seem to go by pretty quickly. I used a playlist from the indoor time trials for the first two but was just watching some shows on the last two. Passing the time is one of the challenges with indoor training. A couple of days ago my coach sent me a week by week outline for my 2013 training with the state time trial, senior olympics, and track and road nationals being the A races. We also talked about scaling back on the weekly local time trials. Last year I rode over 35 events with about 20 of those being the Tuesday 10.25 mile Cleves Time Trial. She's kept close track of my power through the season and how it is affected by the training, races, recovery, etc. While the weekly event is basically training it is still pretty stressful and there are concerns about getting enough recovery. This weeks steady states went pretty fairly well. The Tuesday efforts as noted were right on but Wednesdays, ridden after my one hour spin class and one hour circuit, were a few watts lower and I did not complete all four of the 12 minute efforts. The number of classes taught per week and that I also participate in is another topic of discussion. In the season I only teach and rarely participate but in the winter I participate more. no doubt it affects the power held in training. In all of my circuit classes we incorporate a lot of single leg exercises and balance work. Single leg squats are a great place to start. I know that most of us can hit the incline leg press and push a lot of weight. Years ago I had a trainer who would load eight 45 lb plates on each side and then throw another couple of 40 lb free weights in the center tray. I'm not sure how moving over 800 lbs helped our cycling but it was a challenge. I think a better exercise, even though it doesn't involve the weight, is the single leg squat. We run and bike one leg at a time. The force that pushes us off the ground or against the pedal occurs singularly so why not train that? You can also incorporate some weights and add in a curl to a press as you come up from the squat. We also use the single leg/body parallel to the floor position and add in some curls, flys, etc. getting your body parallel to the ground is the key. You can also try single leg hops, single leg side to side jumps, single leg calf raise with a tricep press, etc. You will likely find one leg is stronger that the other. This is a great opportunity to add strength to the weaker leg. Three weeks ago we started with the 4x8's, then the 4x10's and now the 4x12's. The goal was 320 watts at a cadence of 85. The results were 321, 322, 321 and 324 and cadence or 82-87. Given the rain I did these inside on the trainer. 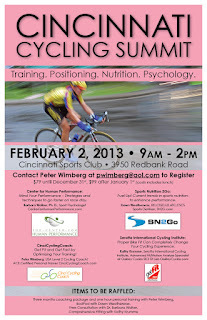 Its good mental training to do these inside especially with the second indoor time trial coming up this Sunday.